I received an email from a colleague who said he was one of those optometrists I mentioned at the end of last week’s Tip on time management who has abandoned staff meetings. He went on to ask what should go into a good staff meeting. He said he discusses practice metrics with his staff, but sometimes it feels there is nothing else to cover. I think many ODs are in that situation. Read on for ideas on how to make your staff meetings more productive. Many optometrists and managers do a masterful job of preparing for staff meetings and for those who want to go to great lengths, I think it is great. But the important thing is that staff members and doctors meet and talk about the practice on a frequent basis. Don’t let preparing an agenda and coming up with topics stop you. Just meet every week at the same time. Block out the appointment schedule. Pay the staff. The communication will result in a much stronger practice and I have no doubt you will increase your gross and net revenues. I rarely present practice metrics at my staff meetings. There is nothing wrong with doing it and many ODs and business leaders get great results by using data-driven goals. Some like to use charts and graphs. Some feel staff members are motivated by friendly competitions. It is just not me and not my style. Being true to yourself and believing in your message is the most important thing. Who should speak? Before we discuss what to say, let’s consider who should say it. I think meetings are better when several people contribute. I would tell some key staff members that you’d like them to talk about a few things at the weekly meeting. Let them prepare in advance, but make sure they know it is very informal. They can make some notes during the week about anything in their area that could be improved. Or just ask some questions about a problem. Of course, I also think it is good for one or more doctors to speak at every meeting. Doctors are natural leaders in the practice and they have great knowledge of eye care. Practice owners also generally have a feel for the business aspects of the practice and they should be prepared to talk about that in general terms. Do you have an office manager? If not, I think you should appoint one and then she/he can assist with the staff meetings. What is new? I observe my practice all week long and I make notes on what I see. I always see things we could do better. I can’t imagine not having something to talk about. I’m always working on something new. If you are not, try to think about how you can improve things. In many cases, it is more efficient to instruct the whole staff at once rather than just one person at a time. But the big rule is to not embarrass any individual in front of their peers. If an issue is really with just one person and everyone knows it, speak to that person in private, not at a staff meeting. What else is new? Any new frame lines? Office forms? Medications? Instruments? Insurance plans? Bring it to the meeting. What is good in the practice? I try to make staff meetings mostly positive. Tell staff what they do well. I often bring some of our patient surveys to the meeting and read them – especially if a patient mentions a staff member by name in a good way. What could be better? It is necessary to talk about problems in order to improve upon them. You may even be able to get some help with solving a problem by asking for staff input. Employees have some great ideas and they may be closer to a situation than the doctor. But be careful about asking for input if you already know what you want to do. It can hurt morale if you ask but don’t give the input a serious chance of working. There is an art to bringing up bad news without making people feel terrible. Try to avoid blame. Definitely avoid anger. Try to state the facts and work toward improving the situation in the future. Eye care education. Staff meetings are a perfect time to teach staff about eye care. It could be medical eye care, the reason we do certain tests, what is a true ocular emergency, contact lenses and there are plenty of things about optical dispensing. ODs can discuss their thoughts about dispensing glasses. A senior optician could present on some aspect of measuring and fitting glasses. A lab technician can demonstrate how to do a difficult repair. Invite sales reps on occasion. I like to screen the content somewhat, unless I know the rep really well, but sales reps can bring high quality education to your meetings. They might be from an optical lab, a contact lens company, an equipment dealer, a drug company or a software firm. Consider providing them a flat screen TV to connect their laptop for PowerPoint. What does the practice need? Seriously, what do you need most? More patients? More multiple pair sales? Higher frame price points? Faster pretesting? 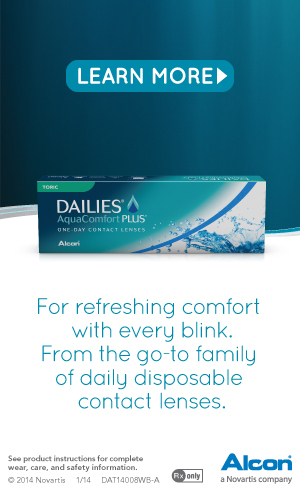 More sales of full year supplies of contact lenses? More sales of premium digital progressives? A higher opt-in rate for screening retinal photos? Better results with recall? A decrease of no shows? Just tell your staff what you need and see if they can help. Employees support what they help to invent! How can we speed up patient flow so we could see more patients per day without stress? What is affecting the business in general terms? How do we compete with online optical vendors or big chain stores? How can we embrace medical insurance as part of health care reform? Are vision plan discounts taking a big bite out of profits? Let staff know what is happening in the profession and industry. Teach staff not to prejudge the patient’s ability to pay. Let’s focus on providing the best eye care first; not the cheapest. It is very unfair for staff to assume they know best about what a patient wants or can afford. Judging based on appearance, clothing, occupation or town of residence is a big mistake and it is discriminatory. Let the patient tell us when they want a more economical option and we will help them with that, but start with the best. Review the patient experience. Have your staff list every point of contact your office has with a patient, starting with the first phone call. Walk through a typical visit. What does the patient see and hear? Consider the eyeglass sale and delivery. How could the experience be improved? How is the customer service at each step? Do a SWOT analysis. Make a list with your staff of the strengths, weaknesses, opportunities and threats to your practice. Discuss how to maximize the good things and overcome the bad. What marketing projects could the practice undertake? How is your community outreach? Practice Facebook page? Website? Recall system? Can staff members help with the projects? Finally, here is a great catch-all question for the doctor to ask if you have nothing else at a meeting: Tell me something that happened recently that made a patient unhappy? Yeah, you really do want to know.